• To subscribe, please click here. • Refresh your browser for the latest update. Scroll down for this month's daily news, or click here for recent months. 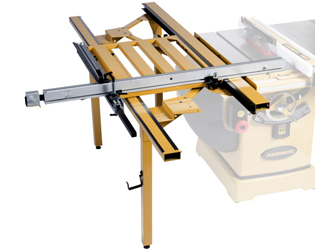 Powermatic table saw owners can upgrade their PM2000B or PM3000B with the new Sliding Table Saw attachment. It bolts to the table saw and lets the woodworker make smooth and precise cuts on large sheets and stock. With a precision bearing track system, it is "engineered to ensure precision while maximizing efficiency and performance". There's an extruded aluminum crosscut fence that slides on the table and quickly adjusts to varying angles. A telescoping fence extension supports longer work, for a smooth and controlled cut. The maximum table travel is 62-1/2" and the miter gauge adjusts from 0 to 50 degrees with six hard stops. The maximum rip capacity with the fence in front is 41", and it's 49" with the fence in the rear position. Saw owners can relocate the power switch box for better access when they add the slider. A quick locking lever secures the fence on the table, and the sealed ball bearings won't gum up with fine dust. 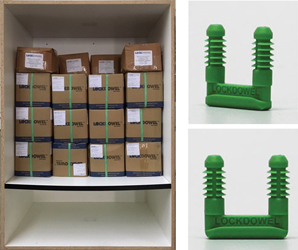 In preparing for new tests by AWI (the Architectural Woodwork Institute), Lockdowel's fasteners were able to hold an astonishing 1,164 pounds on a shelf. The company is rigorously testing their fasteners to pass eight new AWI standards for commercial and institutional joining methods. In the latest preparation test, their Channel Lock fasteners held 1,164 pounds, or 210 lbs per square foot, on a one inch thick board shelf in a tall cabinet (the shelf bowed a little, but the fasteners worked perfectly). Lockdowel fasteners have always passed ANSI and BIFMA standards for AWI and WI (the Woodworking Institute). However, this is the first time that the AWI's National Testing Center (NTC) has validated joinery through their own performance testing. According to AWI, these tests will determine the structural integrity of architectural casework assemblies using various joinery methods and materials. The new testing methodologies have required three years of research. 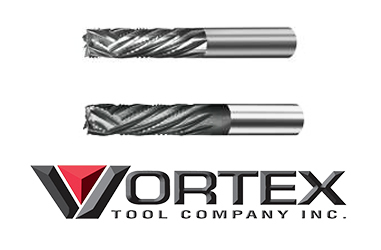 Schofield, Wisconsin based Vortex Tool Company has introduced a new series of tornado compression tooling that has been specially engineered for cutting laminated composite materials. 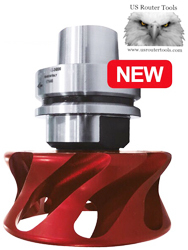 Called the Series 9800, the router bits' unique roughing and finishing flute design yields clean, finished-edge quality while eliminating delamination of the material. Available in four sizes, Series 9800 tooling is offered with or without CVD, which is a diamond coating that's designed to increase tool life when cutting highly abrasive substrates. Vortex, which is American owned and operated, designs and manufactures a wide variety of standard and custom high-performance router and insert cutting tools for the woodworking and plastics industries, and provides re-tipping and sharpening services for all makes and models. I.M.S. is based in Italy, and makes tool holders for CNCs. Among its latest offerings is the Twister, which was first launched about a year ago and is now available through suppliers in North America such as U.S. Router Tools and the IMS store. The company says that this device is a 'must-have' for any high dust applications. It works great to minimize particulates in the air, which helps with both air quality from a health perspective, and also finish quality. It helps keep the work space free from wood chips and residuals, so there's no accumulation and recutting of waste material near the tool. The manufacturer also claims that the Twister is 40% quieter than the competition, and has standard balancing at 25,000 RPM. Using it means that there's less time and cost spent on daily maintenance, and it can be used on HSK or ISO30 tool holders. It's easy to install, and IMS has posted a YouTube video on the product in use. Readers may also want to check out the newest version of the Klein Tornado, which is available from Stiles Machinery and is compatible with Weeke, Homag and many other brands of CNC machines. 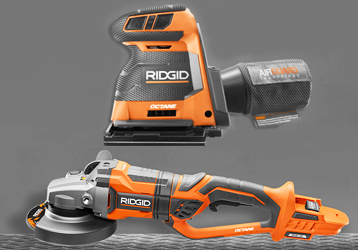 Two new 18 Volt tools coming soon from RIDGID™ will complement the company's Octane™ cordless brand. The brushless 1/4 sheet sander (top) runs at 14,000 RPM, has a 3-mode digital dial, runs for more than an hour on the 9 aH version of the Octane battery, and features 90% dust collection. And the new brushless 7 inch grinder boasts an impressive 6600 RPM. It's optimized to run with either one or two Octane battery packs (! 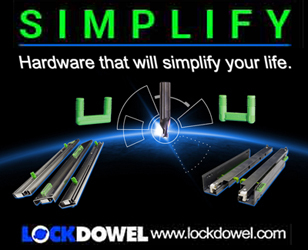 ), and its Twistlock feature delivers a choice of any of its three head positions for enhanced versatility and comfort. The Octane battery family includes 3 aH, 6 aH and 9 aH Bluetooth® options that have respectively two, four and eight times the runtime of RIDGID's standard 18 Volt power packs. The Bluetooth technology reports battery charge level, battery maintence needs, charge completion time, and total hours used. Click on "Promotions" on the RIDGID website for more info. 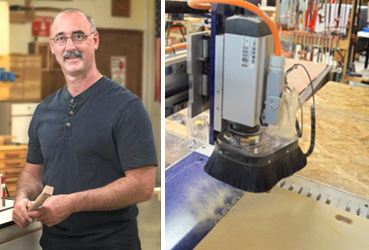 In Hammond, Wisconsin (about an hour from the Minneapolis airport), Vondriska Woodworks will be presenting an all-day class on Saturday, May 4th titled You Can CNC. Students will work with VCarve software to create a design that includes lettering and artwork. They will learn how to create toolpaths, check the paths for accuracy, and export the files for work on a CNC machine. They'll see different methods for securing the work to the CNC table, how to zero the axes, and then cut the project they designed. George will take woodworkers step by step through a wall clock project design that provides many design and toolpath learning opportunities. Everyone makes the same project. When the design and toolpath work is complete, attendees will cut some of the clocks on one of George's CNC machines (there may not be time to cut all of the clocks). This is a hands-on class, accepting a small number of students. The fee is $125. 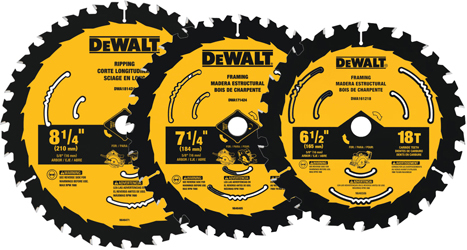 DeWALT has just introduced new 6-1/2" to 8-1/4" circular saw blades that feature an innovative new tooth profile. Designed for durability on the jobsite, the new blades have patent-pending ToughTrack™ tooth design, where an alternate top bevel plus rake (ATB+R) tooth grind helps clear debris from the cutting channel. Body slots on the blades help reduce vibration, and the teeth are made of tough, high-density tungsten carbide that helps them resist wear and provides long life. The reinforced shoulder provides impact resistant for strength and durability, especially against nail-embedded wood. The blades have a ToughCoat™ anti-stick coating to reduce friction and gumming. MAUD Max, the Motorized All-Terrain Utility Dolly, is the latest innovation from SawTrax. 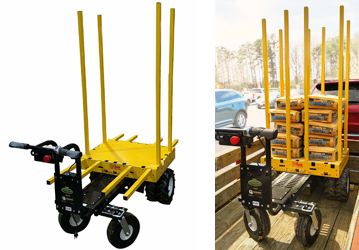 It's a material handling cart that makes it easy to move heavy loads such as MDF or granite tops at the jobsite or indoors at the woodshop. It's so easy to use, even an child can safely operate it. MAUD saves back and muscle strain and is made in the USA. It runs on electric power with zero emissions, zero fumes, and full power all of the time. It has minimal maintenance needs with no oil filters, air filters or gas to add. The all-day battery will run for a full shift on a single charge. With a 700lb weight capacity, flat-free tires (duallies on front! ), and the flexibility to arrange the posts to suit any load, this is likely to become the new favorite material handling dolly for shops and installers. 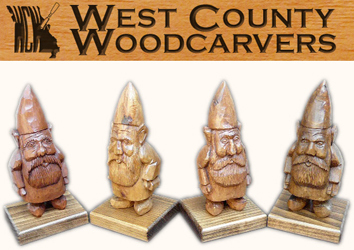 Located about half an hour west of St. Louis, the West County Woodcarvers will hold their fourteenth Annual Show on September 14 from 10 AM to 5 PM at the Salem Church in Ballwin (tentative date). Admission is free, and this is the perfect place to meet carvers and browse their art. There will be more than fifteen exibitors showing work from carving in the round to chainsaw carving, woodburning and relief carving. Then the St. Louis Area Woodcarvers show is scheduled for Saturday October 5th at the Peace United Church of Christ in Belleville, Illinois. And the Midwest Woodcarvers (formerly the Holzschitzers) show is scheduled for November 2nd and 3rd at the Belle-Clair Exposition Hall in Belleville. The first two shows are free, and admission to the Midwest club's show is $4 per person over 12. For a listing of other shows taking place around the nation as well as in Canada, visit Woodcarving Illustrated. WoodEzine reported last October that Rikon Power Tools was going to offer an update for its band saws. The Massachusetts company has now introduced the 10-326 DVR 14" band saw with Digital Variable Reluctance (DVR) technology. 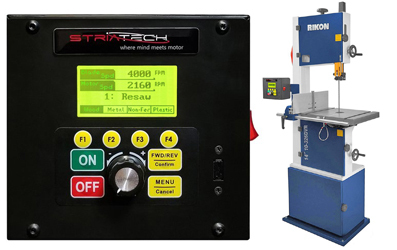 The machine was developed in partnership with Striatech, a subsidiary of Teknatool International. Its 1.75 HP motor's speed is infinitely variable for a better finish cut, improved energy efficiency, less noise and vibration-free operation. It has an easy-to-read screen located on the post, and blade speed goes from 100 RPM (45 surface feet per minute) to 2,375 RPM (4400 SFPM). Continuous torque, fast electronic braking and load spike detection make the saw safer to use. There's Quick-Lock table setting and spring loaded, tool-free blade guide adjustment. We found it for $1,615 at Tool Center. Hexagon Manufacturing Intelligence develops and distributes CAD CAM software including AlphaCam and Cabinet Vision. The company will host the second annual Production Software Users’ Group meeting at HxGN LIVE 2019, June 11-14, at The Venetian in Las Vegas. This is a four-day conference where the physical world converges with the digital. It offers keynote presentations and interactive sessions with product experts on design and manufacturing process optimization, CNC verification technology, tooling and resource management, and specialized solutions for the tooling, production engineering, and woodworking industries. The program is designed to help users and managers enhance their skills, apply best practices, and ensure their companies leverage the latest technologies and user benefits. To view the full session catalogue, click here. 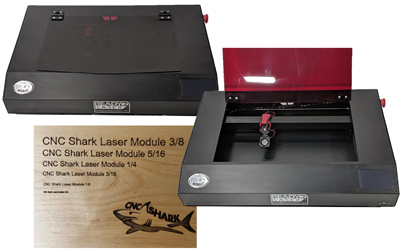 Next Wave Automation in Perrysburg, Ohio, has introduced the Moray Ready2Laser®, an affordable desktop laser system that uses a powerful, 7 Watt solid state laser diode. The Moray includes design software that allows users to create files from almost any image. It can also import images from other software and can raster, trace, and perform light cutting on woods such as balsa and basswood, or on leather and fabrics. The new laser features a 2-1/2" exhaust port for use with standard, shop-style vacuums which are outfitted with HEPA filters, to remove smoke and fumes. For heavy use applications, Next Wave Automation offers an optional, inline exhaust system with a charcoal filtering system. Moray has an LCD color display and uses standard G-code files. Made in the USA, it is available now. 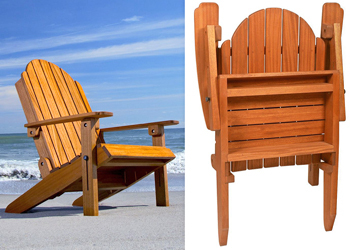 Just in time for warmer weather, Rockler has introduced a new plan and template set for an Adirondack chair that folds up for compact storage. It includes illustrated step-by-step instructions explaining the building process, as well as full-size cardboard templates for parts with more complicated shapes. Rockler also is offering a hardware pack that contains the knobs and stainless steel fasteners required for one chair. When open, the chair is 33" wide x 41-3/4" tall x 35" deep (from the front of the arms to the rear ends of the back legs). Folded for upright storage against a wall, it measures33" wide x 50-1/2" tall x 10-1/4" deep. Easy-to-grip knobs secure the chair in either the open or the folded/storage position. The plan (item 63334) runs $24.99 and the hardware pack (item 68447) is $29.99. 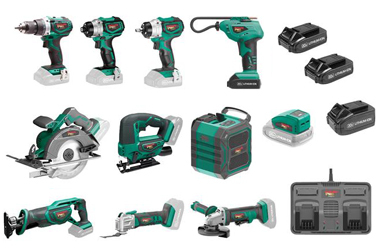 Grizzly Industrial is offering a new lineup of professional duty 20V Grizzly PRO™ cordless tools and accessories. 2.0Ah lithium ion batteries are low profile and lightweight, for all-day performance. Offered individually and as a kit, the ten-piece master kit includes the T30290 hammer drill, T30291 impact driver, T30292 3/8" impact wrench, T30293 circular saw, T30294 reciprocating saw, T30295 jigsaw, T30296 oscillating tool with nine accessories, T30298 inflator with an LCD panel, T30299 angle grinder, T30300 Bluetooth speaker, a T30301 USB adaptor, two T30304 2.0Ah batteries, one T30305 4.0Ah battery and a T30303 2.4A dual port charger. The catalog price for the entire kit (April 2019) is $549.95. Some individual tools are sold with battery and charger included, and some as tool only. 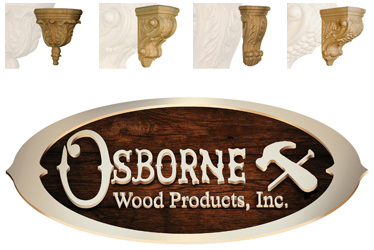 Osborne Wood Products is celebrating 40 years of supplying the cabinetry, remodeling and furniture trades with the highest quality decorative wood components. 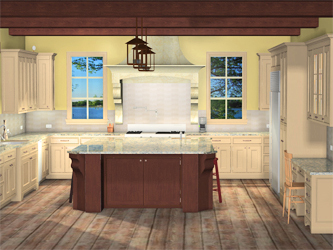 Founded in 1979 in the Appalachian foothills town of Toccoa, Georgia, the family-owned and operated company has grown to become a leading international wood furniture components manufacturer and high-tech logistics company. Osborne Wood's humble origins trace back four decades to when Leon and Janice Osborne began manufacturing wood furniture components in their garage and selling them through a local country co-op. Since those days, the company’s offerings have grown, as has its cutting-edge, 80,000 square-foot manufacturing and distribution facility fully equipped with state-of-the-art CNC woodworking equipment. The current exhibition at The Messler Gallery in Rockport, Maine showcases artist-made coffins and urns, and is titled "Boxes To Die For". It will pass into a better life on April 10th, to be replaced by "Current Student Work" which runs from April 19th through May 29th. The Messler is on the campus of the Center for Furniture Craftsmanship, and the gallery is always a huge treat for woodworkers. 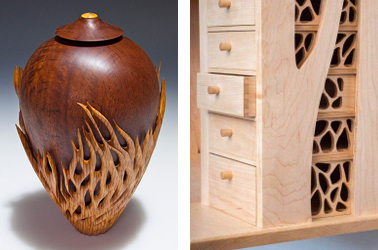 Shown here are (left) Australian artist Neil Turner's magnificent "Final Destination" which is an urn executed in sandalwood, black fleck jarrah and sheoak; and (right) a detail from a maple and stained glass cabinet named "Li" by Maine artist Rachel Davis, which was part of last year's student work exhibition. The gallery is open Monday through Saturday and is located at 25 Mill Street. WoodEzine has heard from Jerry Johnson at North Carolina based J&G Machinery that the Italian manufacturer Griggio is, at the moment, not conducting any business. The Griggio website is still up as of April 1st, but the email contacts no longer work. The company had recently introduced a family of industrial grade sliding saws equipped with SawStop™ licensed safety technology, which is something that small production woodshops are quite interested in. Founded in 1966, J&G Machinery offers new and used machinery,parts, and in-house and on-site support. 2. All contents of the site are copyrighted by BHSW. It is illegal to share or use any of the content of this website without the owner's written permission.